From a Blue Stars press release: Blue Stars is pleased to announce that its 2007 color guard staff will be led by Mark Metzger, Luke Holliger and Fred Feeney. Metzger comes to the Blue Stars with an extensive background in the pageantry arts. Currently the director and designer for the James Logan High School color guard in Union City, Calif., he will serve as the lead designer for the Blue Stars. Holliger returns to the Blue Stars in 2007 for his fifth season of service. He joined the Blue Stars staff as color guard caption Head in 2003 and helped lead the corps to a DCI Division III Championship that season. Fred Feeney returns to the Blue Stars in 2007 for his second consecutive season as color guard and program advisor. A former member of the Blue Stars in the late 1970s and staff member in the early 1980s, Feeney currently serves on the board of directors for Winter Guard International. 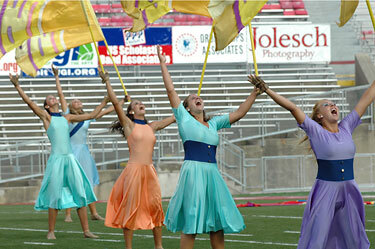 "We are thrilled to have a color guard staff with a tremendous amount of experience and creative energy. Our members will continue to grow as individuals and as a unit with the leadership, talent and passion that these individuals bring to the Blue Stars," said Blue Stars Director Chad Armbruster. Read more about all Blue Stars color guard staff members at www.bluestars.org.